How about joining me for a Valentine Tea Party with some Red Velvet Scones? My sweater-clad bear is hosting today, and he's basking in the warm glow of candlelight. This picture of my late beloved and I, was taken when we were so young. Yes, we were high school sweethearts. My pretty teacup was given to me by dear Celeste, from Southern DayDreams, in Stephanie's last teacup exchange. Doesn't it look so pretty with the black background on my tablecloth that I made several years ago? 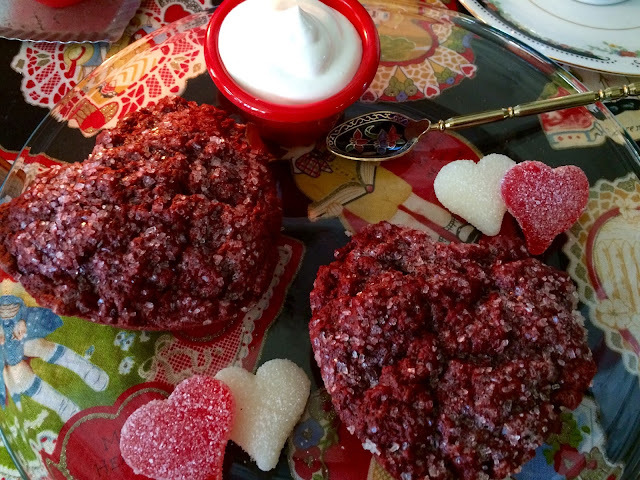 The recipe for the Red Velvet Scones comes from the 2015 February issue of Tea Time magazine. I made a mock Devonshire cream to serve with the scones. There's one for each of us! In a large bowl, combine flour, sugar, cocoa powder, baking powder, and salt, whisking well. Using a pastry blender, cut butter into flour mixture until mixture resembles coarse crumbs. Set aside. In a liquid-measuring cup, combine cream, food coloring, and vanilla extract, whisking to blend. Add to flour mixture, stirring to combine. (If dough seems dry, add more cream, 1 tablespoon at a time, until dough is uniformly moist.) Working gently, bring mixture together with hands until a dough forms and is evenly red. Using a levered 3-tablespoon scoop, divide dough evenly among wells of prepared pans. Pat dough into wells to create a level surface. Sprinkle scones with sparkling sugar. Bake until a wooden pick inserted in the centers comes out clean, approximately 15 minutes. Let cool in pans for 5 minutes. Remove scones from pan. Serve warm with Mock Devonshire Cream (recipe follows). I've never had the real Devonshire Cream, therefore I don't know how to compare it, but this was really good with the scones, and also on top of fresh berries. This is one of the old-fashioned prints on the tablecloth. Don't you just love these nostalgic Valentines? Oh, Valentine's Day is one of my favourite events of the year...must be all the red, pink and hearts! I am hoping to do a little ''love'' crafting this evening... 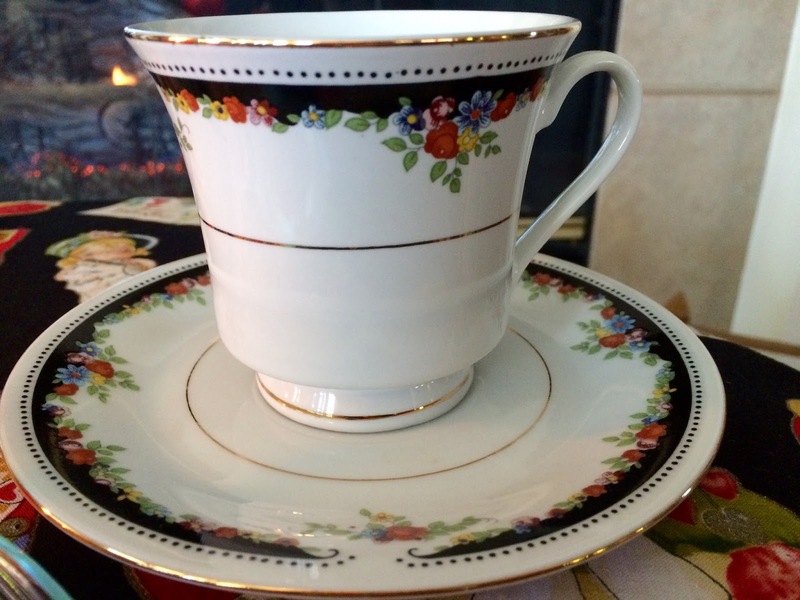 I love the tea cup Celestina blessed you with - very elegant and how sweet is your bear! It is always a delight having tea with you, dear Kitty! Those scones look and sound so lovely! Aww...and you and your beloved were high school sweet hearts - that is beautiful! Kitty, that scone looks delicious, I would love to have one and a cup of tea with you this morning. I didn't renew my subscription to Tea Time when I moved, now I must do that soon. What a wonderful display of yumminess. Your scones look wonderful and make me want to run to the kitchen but instead I am on my way to the denist - ha! Looks like you got a great cup and saucer in the exchange too! Love the colors. I am printing your recipes too! I also posted a link to this post on my face book page: Bernideen's Tea Time, Cottage and Garden! Oh my goodness, the scones look so delicious. Maybe this is a sign to make them, I haven't had red velvet anything in years. Such a cute picture of you two in your younger days. Perfect for Valentine's Day! Love seeing the photo of you and your Beloved again. Just a couple of kids in love. And you are both so stinkin' cute! Your new tea cup is exquisite...I love the dark with the light and the rich colors of the flowers and the black tiny dots are darling. Wow Kitty, these red velvet scones look delicious! Sure wish I was there to have tea and scones with you! Love that teacup, in fact I cannot wait for the next swap! I love red velvet desserts of any kind. thanks for the recipe. I will be trying it soon. And what an adorable Valentine! Hi Kitty, what a lovely tea and the red velvet dessert looks so so good. I love seeing the photo of you and your dear hubby from high school. What a darling couple you are there. Sweet precious memories for sure my friend. Look at your sweet teddy sitting near by. The perfect Valentine tea. Thanks for sharing the recipe. Hope you enjoy a nice week. See you soon! Oh my, red velvet scones. Now that is perfection Kitty. I definitely have to give this recipe a try. Thank you for sharing and Happy Valentine's day. What a sweet picture of you and your sweetheart. Both just so adorable! Those scones look delicious with the cream, perfect for Valentine's Day. 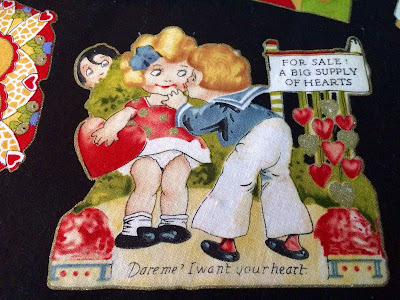 And I do love those vintage Valentine's messages. What a pretty teacup from Celeste to go with your tablecloth. Aw, Kitty, the picture of you and your sweetie is darling! I love that it is in a heart frame. You both look so sweet. Your scones look wonderful. I also make the mock Devonshire cream because I've never had the real thing. I don't make it often though because my sweetie doesn't care for it. Those vintage Valentine cards are so cute. I remember how exciting it was to receive them at school in my mailbox. Thank you for sharing with us and have a lovely day, my friend. My mouth started watering when I read "red velvet scones"! Oh, my! 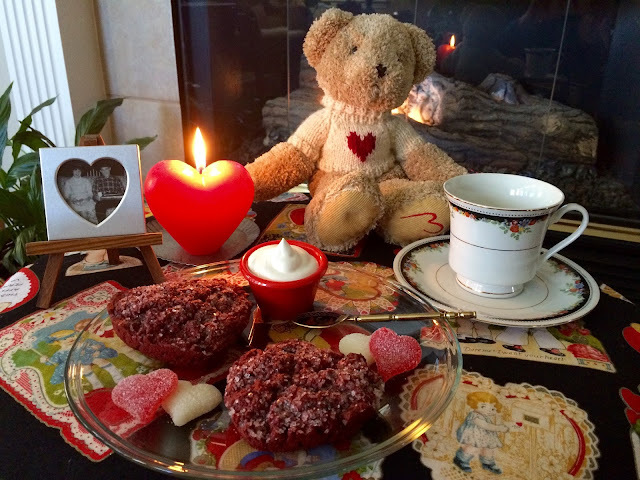 Love the teacup and your Valentine vignette ... complete with Teddy bear. I adore vintage cards. Hi Kitty, I love scones and these are so pretty and I'm sure delicious. I love vintage and these prints on the tablecloth are so sweet. Love the pic of you and your late beloved, thank you for sharing it. Happy Valentine's Day Kitty……..
What an adorable post! I heart everything on your Valentine-themed photo, from the sweet throwback photo to the yummy red velvet scones (I didn't even know such a thing existed until now!). Happy Valentine Week, Kitty! What a lovely Valentine tea! The scones look amazing and I wish I had one for my coffee in the morning. :) I love the tea cup and saucer ~ just beautiful! The photo is so precious! That's a cute photo of the two of you, so young :) What a lovely cup and saucer, very elegant. Such a precious post, Kitty...I adore everything about it! The darling tablecloth, the BEAUTIFUL tea cup, those yummy looking scones & especially that adorable photo of two young lovers. I know you cherish the wonderful memories you made with Rich & I know, too, that he is looking over you from Heaven. I like to think he & my Ern have met up & are sharing coffee & treats on a cloud & watch the OSU games together with a birds eye view. The scones look delicious - I'm sure my daughter would enjoy some since her favorite cake is red velvet! Mmm, the red velvet scones look good Kitty and I purchased heart shaped muffin pans from Dollarama before we left home. I use buttermilk in mine and what a difference the brand in Florida makes, the scones rise more and are fluffier. Red velvet scones! What a nice idea! They look delicious; thanks so much for sharing the recipe. Wow your tea time and scones look so good! Thanks for sharing this recipe at Cooking and Crafting with J&J! Happy Valentines Day! What a lovely tea time and those scones look delightfully delicious! 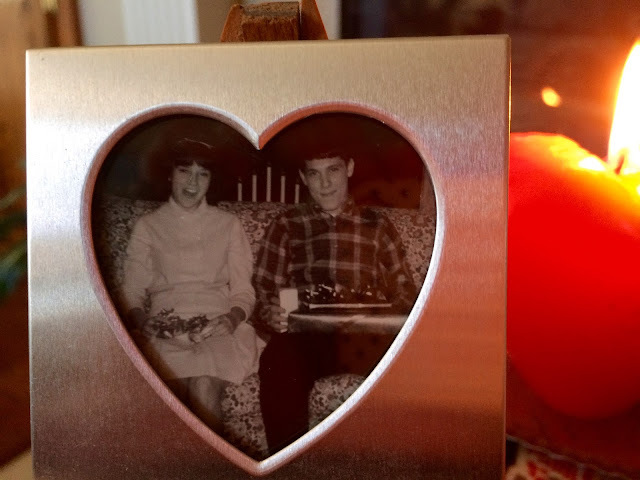 I love seeing the photo of you and your sweetheart all those years ago. Doesn't it make you wonder where the time went? I think that sometimes. Your teacup is very pretty with the tablecloth. Kitty, I left several messages here, but for some reason they are not visible. Maybe they went to your trash or it could be I am having computer problems. Safari is not working as it should. Any way Happy Valentine's Day. I would love one of your scones right now with my coffee! They look so delicious. We have a bakery that makes those half moon cookies and the bottom is red velvet. I may have to get one for Valentine's Day. Such a cute picture of you two in your younger days. Hello, I love scones... Loved the photo, I am sure you were very happy! Hi Kitty! Your tablecloth is so cute! I've been wanting to try a red velvet scone recipe--thanks for sharing. The picture is so cute... ah, young love! Oh how wonderful these scones look!!! Your scones look so good, dear Kitty! I think my hubby and son would enjoy these. And the photo fo you and your darling...just precious! Kitty, what an adorable photo of you and your beloved! What a cute couple you were! And I love heart-shaped scones any time of year. How lovely, Kitty. Scones look delicious. I have made Devonshire cream and also had it in various tea rooms. Some I liked, some I didn't. I make it just with whipping cream and vanilla and a bit of sugar most of the time. You sure do look like a couple of kids in that photo. You have such beautiful memories that I know are very precious to you. Ah, life. Happy that love lives forever. Kitty, your scones look amazing. I can just imagine one of those with a cup of coffee. It was so much fun today. Can't wait for our next get together for lunch. Thank you so much for joining Thoughts of Home on Thursday. It makes us just so happy that you all linked with us. I would love to taste your scones and have a cup of tea with you. Sweet pic of your sweetheart and you. You look like babies. I know you miss him. Red velvet scones sound like heaven Kitty! Happy Valentine's Day! I just love the photo of you and your love. Your Red Velvet Scones look wonderful, I would love having them with my tea, what a treat! Hope you have a very special Valentine Day and thanks so much for sharing with Full Plate Thursday. Kitty, your blog is as sweet as you. I love the high school pic of you and your late Hubby. So cute. Beautiful tea cup and yummy looking scones. I'll have to try the recipe. I can't wait to scroll back and look at more recipes. It was really nice meeting you yesterday. I can't wait until the next gathering. Happy Valentines Day to you! I adore the picture of you and your sweetheart. Young love is an amazing thing...especially when fortunate enough for it to endure (we were only 19 and 20 when we married)! The scones sound lovely, and I adore the gorgeous spoon...it matches so well with the teacup gifted to you! I hope you have a blessed Valentine's Day! Oh man...these sound so delicious! Kitty, I love that high school sweetheart photo of you and your love! The tablecloth is so cute and the scones sound delicious! Happy Valentines Day and thanks for sharing with SYC. Hi. New follower and new to your blog. Saw you were a fellow Texan so had to hope over and meet you. Hi Kitty- what a cute table- love the bear and of course the picture of you and your sweetheart. That tea cup is perfect for you- just the right colors. Hope you had a nice Valentine's Day! That picture of you and your sweetie is adorable. Beautiful decor and thanks for sharing the picture of you and your sweetheart. I've never had a red velvet scone but I'm eager to try the recipe. We would love for you to share this at Celebrate Your Story Link party at http://www.thesweetsensations.com/welcome-to-celebrate-your-story-link-party/. Hope to see you there!